After moving home, I began working at the family business. I was the third generation to work in the printing business; over seven decades in the trade. In 2010, we had the opportunity to add event signs to our portfolio. What began as making a few corrugated signs for a golf outing has turned into a regional sign company. 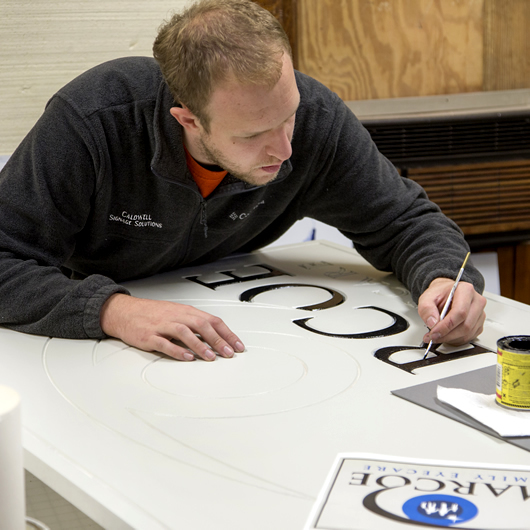 We manufacture everything from traditional hand-painted signs to vehicle wraps to LED message centers in Venango County. Venango County is a great place to build a business. Our location makes it easy for us to service our customers who are primarily located in western Pennsylvania and eastern Ohio. We have been able to effectively compete in the Pittsburgh market because we are just far enough away to provide “small town customer service and quality” but yet close enough to offer affordable, quick, and reliable installation and service calls. Thanks to the many networking opportunities, we have been able to build a customer base and rely heavily on personal referrals.